I’ve been hearing about several attempts to foster “Robotics and Internet of Things” projects here in Utah lately, so I was happy to see a member bring an ESP8266 to ProVolt for electronics night. 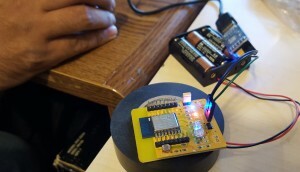 The ESP8266 is an extremely cheap programmable wifi enabled device that some refer to as an “Internet of Things enabler”. ESP8266 Internet of Things programmable wifi module. The low cost (around $3.50), and easy programmability of this device make it a great starting point for an IoT project. We’ll probably order a bunch of these to have around to play with.